It has now gotten to the point where I actually cannot remember what life was like before I got my Oster Dura Ceramic Air Fryer. Seriously, I use it at least once a week. It’s by far the best air fryer we’ve ever tested here at BGR, but it’s also so much more than that. It’s a roaster, a grill, it can saute, and it can even bake. It’s basically the Instant Pot of air fryers, and it’s back in stock right now on Amazon. 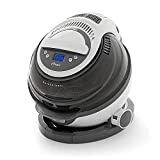 This model will cost $160 if you buy it direct from Oster, but Amazon’s offering it right now for just $129, or $125.95 if you clip the on-site coupon!